Taking your child to the dentist for the first time is a big step. Keep these tips in mind and be sure to check if you’re eligible for the Child Dental Benefits Schedule. We make every effort to ensure your kids are cared for in a safe, professional and fun environment. Our professional and experienced dental team is passionate about kids making our care and prevention program highly effective. In addition to the high level of dental care your kids will love the dedicated kids corner in our waiting room which is equipped with an IPad, toys and colouring equipment to make sure they are occupied in a fun manner while you wait. We understand that dental expenses could add a considerable expense to you and as such we have intentionally partnered with health funds that provide reduced out of pocket expenses for members and their kids. The first thing you need to do is to keep all mentions of the dentist positive. If your child overhears you complaining about your own dental visits, they can pick up this behaviour and attitude and it will make it harder when it comes time for them to go, too. When it is their turn, keep up the positivity. Avoid words such as ‘hurt’, ‘needle’, and ‘drill’, and let them know that the dentist just wants to take a look and make sure everything is growing as it should. You may be able to find a storybook about a dentist so that your child can relate to it and see images of the chair, room and lights so that he or she knows what to expect. Similarly, the Australian Dental Association recommends ‘playing dentist’ at home to get your child used to someone looking at his or her teeth. This might only involve taking turns to put on sunglasses, shine a light into the mouth, and counting the teeth, but it will all make your young one feel more comfortable during the real thing. The old trick of bringing toys along to the appointment can also be a huge help, so don’t forget to throw a couple of their favourite distractions in the bag just in case they become upset. Some fussing during this appointment is nothing to worry about, but if your child is truly unhappy and can’t be calmed down, simply remove them from the situation and try again in a few months. The Child Dental Benefits Schedule (CDBS) is a project that offers free basic dental services to eligible children aged 2-17. Approximately 3.4 million Australian kids qualify for this program every year, which saves families around the country thousands of dollars in dental bills. Treatments include many of the usual issues children face, from basics such as X-rays and check-ups to extractions and fillings should they need it. Each child in the program is entitled to $1,000 per two-year period, but it is important to note that this fund does not cover high-end services such as orthodontics. Every year, the government writes to eligible families to inform them about the CDBS and let them know that their child or children are entitled to the benefits. The requirement is that the child is eligible for Medicare and from a family that is receiving Family Tax Benefit Part A, or one of several Australian government payments. This includes the carer payment, youth allowance, parenting payment, disability support pension, ABSTUDY, special benefit and more. 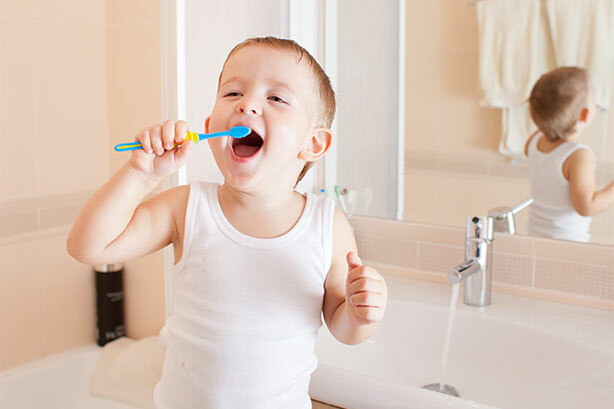 Your child’s first appointment at the dentist will consist of a training session on oral hygiene such as brushing and diet, as well as a checkup to see if all the teeth are healthy. The dentist will also take a look at your child’s jaw to ensure there is no misalignment or other growth problems. You can book your appointment as soon as the child begins growing teeth, which is usually around the 12-month mark. To book your child’s first visit to the dentist, get in touch with the professionals at Harmony Dental. Our team are trained and experienced in looking after teeth from the very first visit, and will be happy to talk you through this experience.